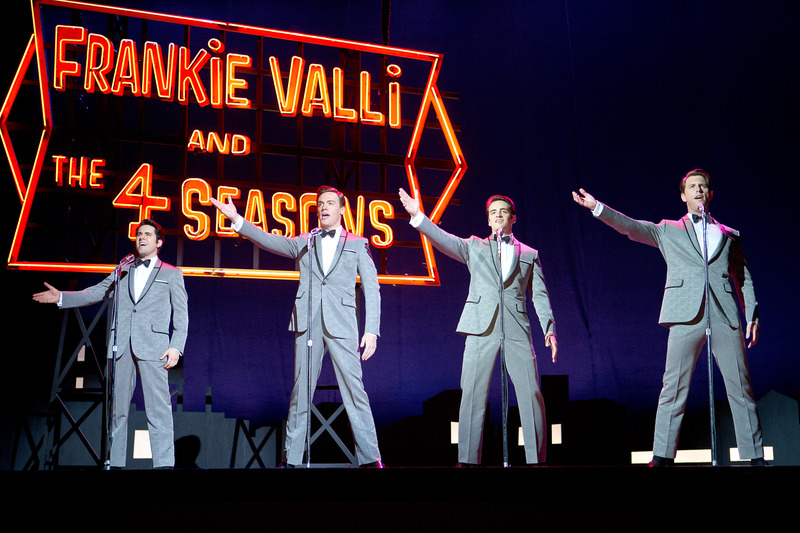 Clint Eastwood’s ‘Jersey Boys’ opens June 20, 2014 Photo Credit: Warner Bros.
Here’s an “American Dream” jukebox musical story set in the 60s about a talented group of singing teens from one of the worst neighborhoods in New Jersey who believed in themselves enough to make it to the top. There was no American Idol, no The Voice, and no Glee for validation. In fact, the tough-guy cowboy TV show Rawhide − in which Clint Eastwood (director of Jersey Boys) starred and who has a cameo in the film, as Rowdy Yates – was standard fare back then, along with Gunsmoke, Bonanza, and The Rifleman. Yes, The Ed Sullivan Show was popular, although mainly for entertainers who had already made it big. The film Jersey Boys is based on the highly successful and popular stage play of the same name and stars John Lloyd Young, who originated his Broadway Tony-Award-winning role in 2005 as Frankie Valli. The other group members are Erich Bergen as Bob Gaudio and Michael Lomenda as Nick Massi, both of whom were in the traveling Broadway play, and Vincent Piazza of Boardwalk Empire fame as Tommy Devito. We don’t quite get all the showbiz glitz and glamor, but we do profit from the emotional side of the story. Frankie Valli and the Four Seasons’ rise to the top did not happen without sacrifice. And, if you don’t know their story, you’ll be surprised by all the emotional drama that’s included. Eastwood did a fine job of presenting their tale – warts and all. The bonus is the singing, as the cast preformed each song live, on set, with amazingly no lip-syncing. Their energy and excitement is intoxicating as each new hit – “Sherry,” “Walk like a Man,” and “Big Girls Don’t Cry”− is introduced, along with a few tidbits regarding their backstory. Young amazingly pulls off playing Valli at the age of sixteen in the beginning of the film and much later in life − none of that dreadful J. Edgar aging make-up, thank goodness. A creative technique by cinematographer Tom Stern that works well is reinforcing the film’s feeling of the past; by repeatedly desaturating the colors, using a sepia tint that gives the film a faded postcard look, and, at other times, monochromatic. Occasionally, the colors are bright and vibrant when an original Andy Warhol painting is adorning the walls, or in the closing dance number, which is more of a curtain call and a nod to the flashy stage production. We also see the colors enhance as the group’s popularity does. Christopher Walken plays a mob boss who genuinely supports Valli’s singing. In one touching scene, he’s even brought to tears by Valli’s falsetto voice during a slower ballad. Walken’s character is not so much a Mr. Macho, but more of a godfather and mentor to Valli. You won’t see anybody getting wacked or any violent bloody scenes as typically associated with a mob component in a film. However, a real “threat” hangs over the group that’s created by Tommy Devito’s mob debts. The viewer is spared, but the stress created is overwhelming. If you enjoyed the stage play, I surmise you’d be entertained, if not enlightened, by the film, as it does delve deeper into the group’s emotional psyche. Upon leaving the theater, I could still hear the catchy tunes and couldn’t help but crack a little smile. The negatives are the film’s length; it’s about twenty minutes too long and some storylines needed to be more developed, such as with Valli’s first wife, Mary Delgado played by Renée Marino and the relationship with Francine Valli his oldest daughter played by Freya Tingley. Bottom line: An “American Dream” story with an authentic period piece feel due to clever filmmaking. Toe-tapping songs mixed with the back story included, sung by talented actors who eerily resemble Frankie Valli and the Four Seasons’ sound and look.